The Union of Comoros (pop. 626,000; GDP/cap US$647) was a French colony until 1975. This picturesque archipelago consists of three islands in the Indian Ocean, situated between Mozambique and Madagascar: Anjouan, Grande Comore and Moheli. The fourth, Mayotte, has remained under French rule. The Comoros Islands are blessed with warm tropical weather, extraordinary flora and fauna, and incredible white sandy beaches. 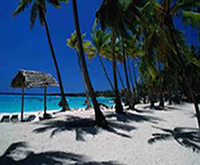 Comoros' beaches are considered to be among the most beautiful in the world. Comoros is also the world's largest producer of ylang-ylang and the world's second producer of vanilla. Poverty remains pervasive in Comoros. It is among the poorest and least developed countries in the world and is heavily dependent on subsistence farming and fishing. The lava-encrusted soil formations as well as the varying quality of land of each island make agriculture difficult. The country has had more than 20 coups and coup attempts since independence in 1975, some supported by French mercenary Colonel Bob Denard. In 1997 the islands of Anjouan and Moheli declared unilateral independence causing an outbreak of fighting. In 2001, the Union of Comoros was created. The new Constitution granted each of the three islands their own president and greater autonomy. Each individual island president is in turn a Vice-President of the Union of Comoros. The 2001 Constitution also stipulates that the presidency of the Union passes from island to island at each new election. But this did not stop the fighting.